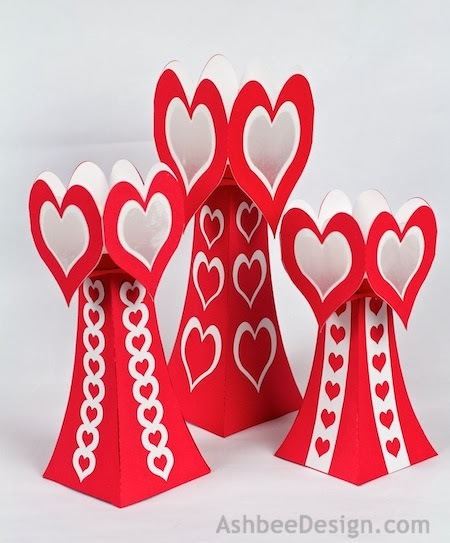 3D Valentine Luminaire - Tall here. 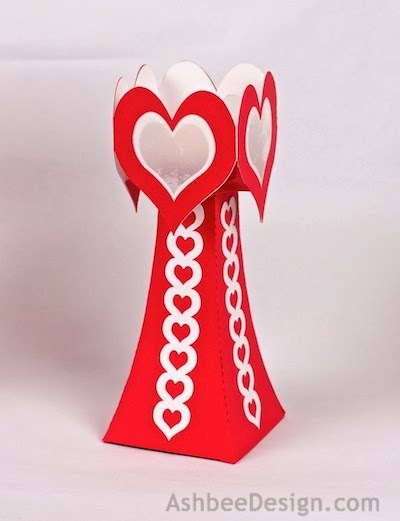 3D Valentine Luminaire - Medium here. 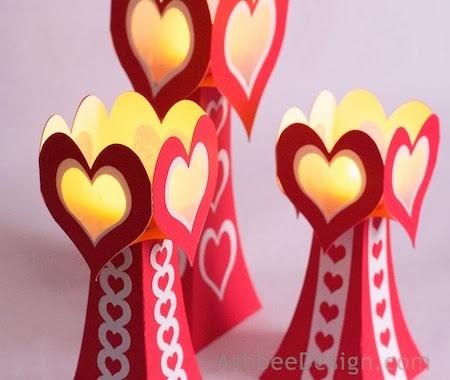 3D Valentine Luminaire - Small here. Important Note: If you purchased the Tall Luminaire before 1/22/14, you got a second copy of the medium one. There was a mix-up at the store. If you need the tall one, you can restore it through your Silhouette Download History on your My Account page, or email me directly at my email address in the side bar below. Using some classic Scandinavian motifs as inspiration, I have designed three tea light luminaries to grace a Valentine table or mantle. Add an LED tea light to each. 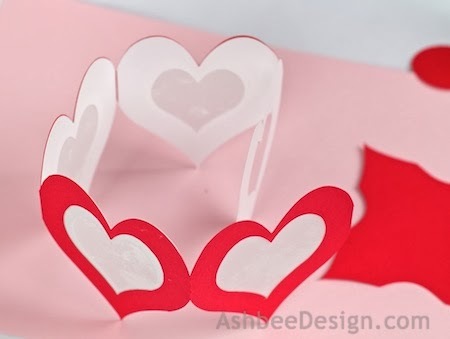 All three are made the same way but each cutting file is different in size and base decoration. The tallest is 11.5 inches tall, middle is 9.5 inches tall and the shortest is 8.25 inches high. They make an attractive grouping together. Tutorial assembled using Silhouette Software Release 2.7.18. 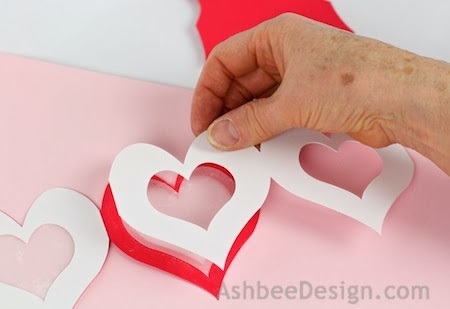 This tutorial assumes you already know how to use the Silhouette and Silhouette software. It can be cut on both Cameo and Portrait Silhouette machines. 2. Prepare and cut the file. All pieces fit within an 8 x10 cutting area but you will have to rearrange them to do so. The parts will need to be separated by paper color. I used 8.5 x 11 card stock and split them up according to this diagram. I know the view is tiny but if you look on the actual cut file, I provided some simple instructions on which groups need to be cut from which color. Of course you can be creative and try something different as well! Note: If the file is grouped together, select it by clicking on it, go up to the OBJECT MENU in the Silhouette software, and down to the UNGROUP command. This will allow you to copy individual elements and paste in a new file (FILE MENU to NEW). 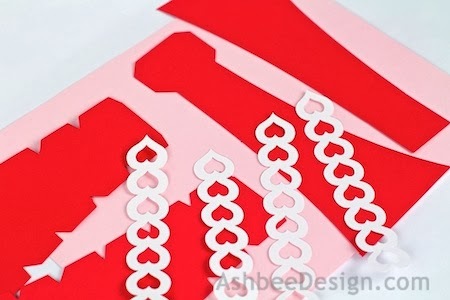 White trim hearts (different in each design). 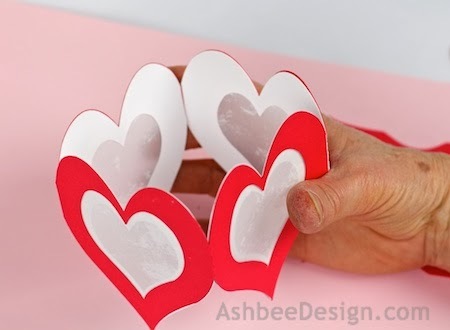 Glue the trim hearts up the center of each base piece. Repeat on all 4 base pieces. Fold back all the tabs on the edges of the two bases. They get folded away from the white design just added. 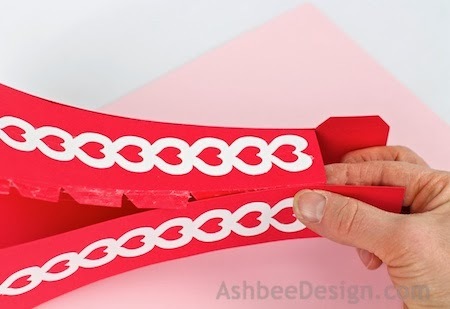 Apply paper glue to all the tabs on one base piece. 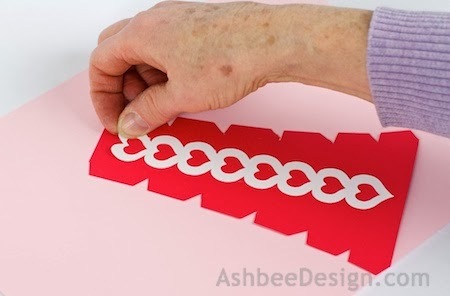 Align the top edge of a tabbed base piece to the dotted fold line of an untabbed piece and start gluing the tabs in place. Work your way down the base keeping the edges aligned. The base will start to curve as you glue the two curved edges together. 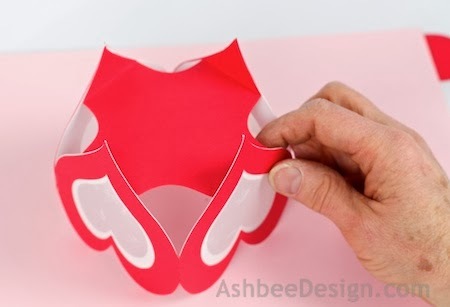 Watch the curved edges and keep pressing them as the glue dries. 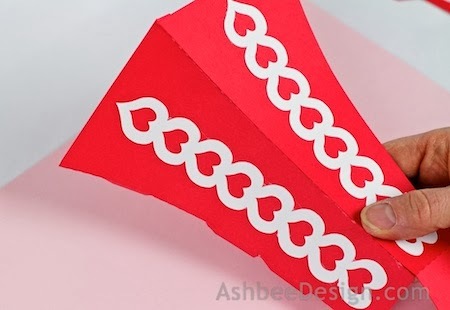 Add the fourth base piece and bring it around to connect altogether. 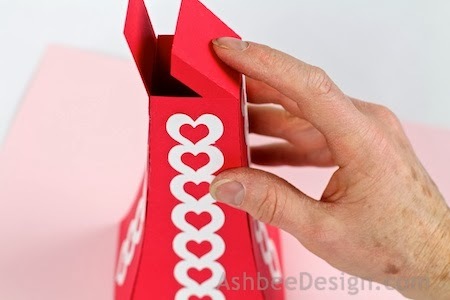 Fold over the tabs on one top piece, add glue and glue it down inside the column. 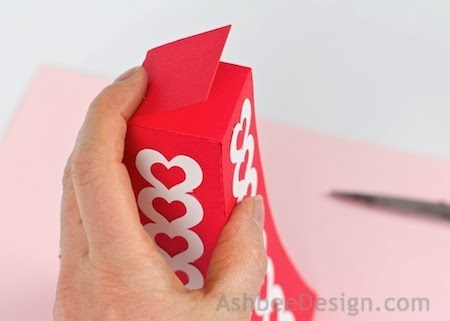 Fold over the remaining top piece and glue in place. 4. Now glue the top lantern area together. 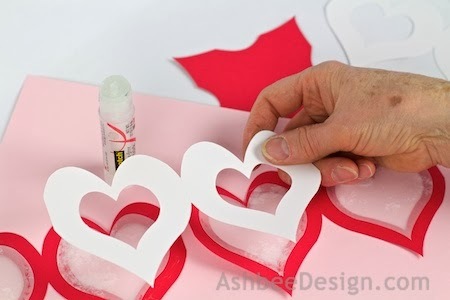 Start by gluing the vellum into the center hearts of all 4 red hearts. 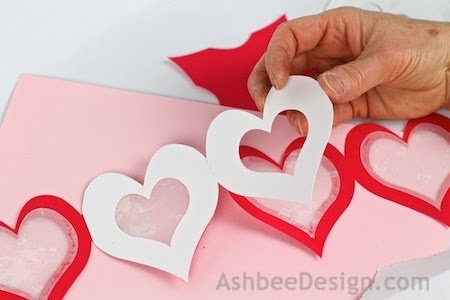 The white hearts will cover the edges of the vellum but the order that you glue them is very important because they are staggered. Line up the two pairs of red hearts. 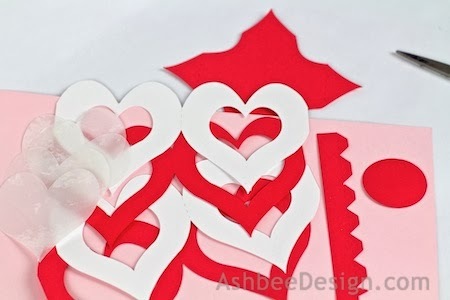 The first pair of white hearts will be glued over the right heart of the first pair and the left heart of the second pair. 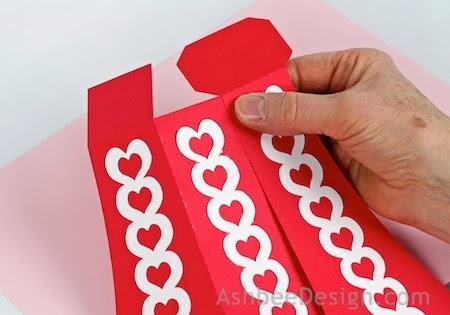 The 4 red hearts will now be connected in one strip with the white hearts holding them in place. 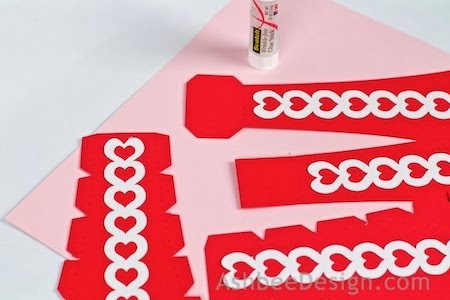 Now glue the left white heart of the last group to the farthest right red heart on the strip. There will be nothing under the last white heart. 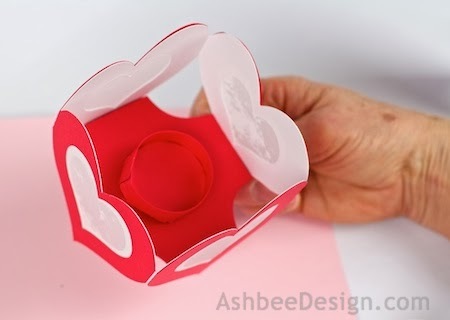 The last white heart wraps around and gets glued inside the first red heart. 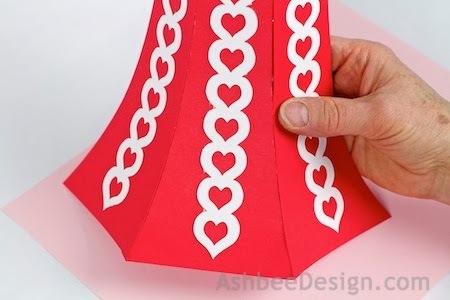 If you assembled them correctly all red and white hearts are now connected into the lantern top. Fold down the 4 tabs on the cross base piece. Add glue to one of the points. Glue the opposite corner in place working to keep this platform level. Glue the last two points in place and allow to dry. 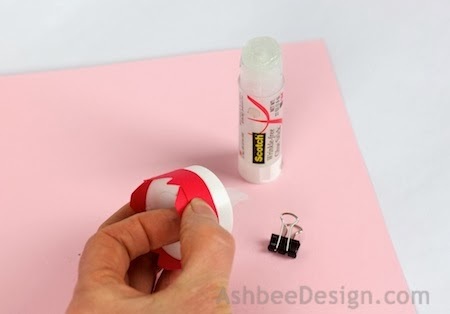 Wrap the tabbed strip around a Tea light loosely and glue in a loop. You want to be able to easily slide the tea light in and out. 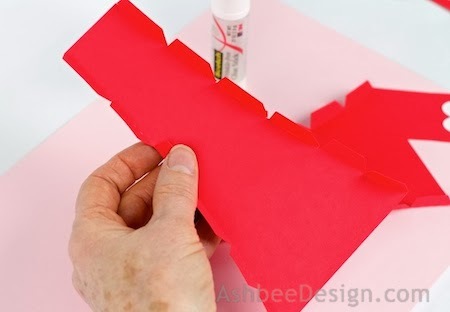 Fold in all tabs on the strip and glue them to the bottom of the red circle. The red circle goes inside the collar and the tabs are visible on the bottom. 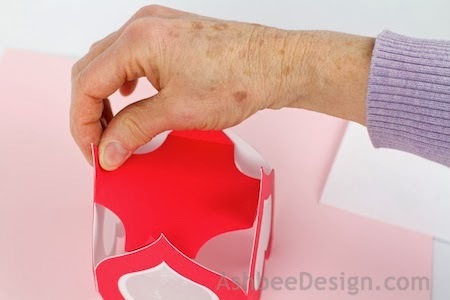 Glue this into the center of the luminaire lantern top base thus covering the tabs. Allow to dry. 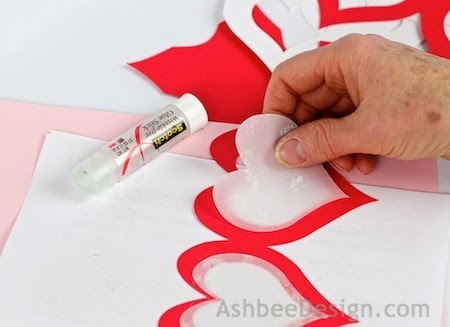 Glue this onto the top of the base being careful to center it. Add a tea light and you are done! 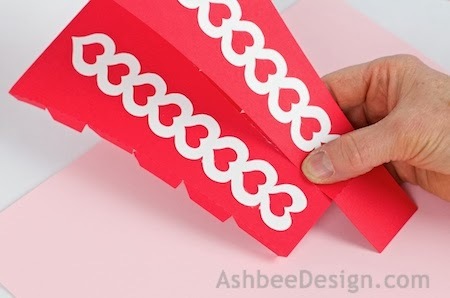 How about making the other two coordinating Valentine Luminaries as well?